I’m back to the world of blogging after a long break over the holidays. I have to apologize for my absence. We enjoyed a holiday with family overseas, followed close behind with too much stress with changes to our routines. Last month saw Charlotte begin preschool (a milestone that she is thoroughly enjoying! ), a new job for my husband and a lot of work in my day job for me. As a result, cooking and blogging have taken a break. Thank you all for being so patient with me! Let’s start the new year of charlotteats.com with a raw detox salad, straight from the farmers market in Bondi. The salad we made was really put together for us. We only came up with the dressing and extra bits found from the same market stalls. 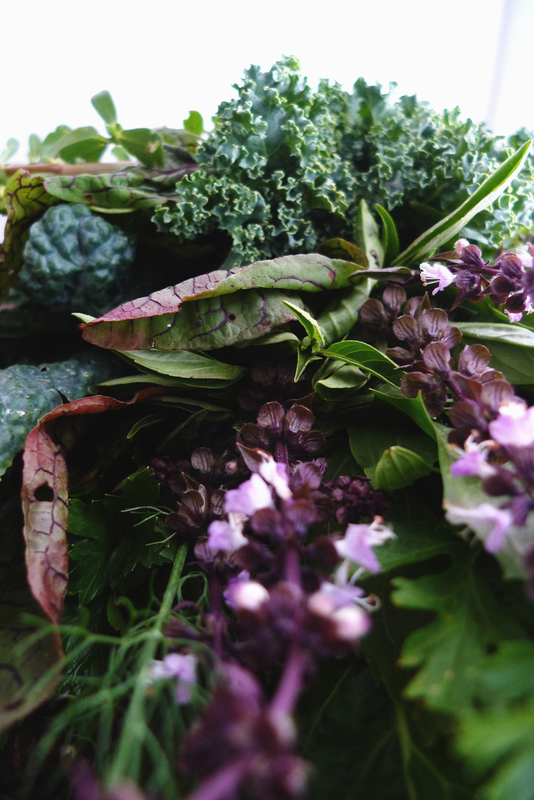 The photo above is a direct shot from the beautiful bouquet of green leafy salads and herbs put together from our local farmer, Field to Feast. It was so gorgeous that we had to buy it! In fact this is typically how we get introduced to new foods; the look sells it! Many thanks to the lovely couple at Field to Feast who are our regular source of fresh seasonal veggies. 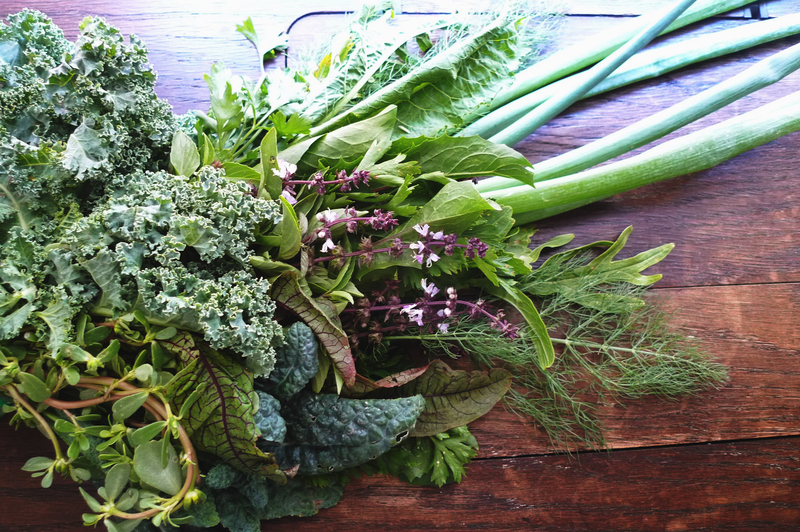 When we visit their stall at our local farmers market, we learn so much about the vegetables and herbs that they grow; many of which we have either never heard of or never thought possible to eat. They are a great source of inspiration to our cooking and eating and have expanded our understanding of seasonal and raw foods. Thank you guys for your passion and sharing it with us! In the list of ingredients below, I have included the greens that I could identify from the salad bouquet. However, I encourage you to be creative with any greens that you come across at your own farmers market or health food shop. 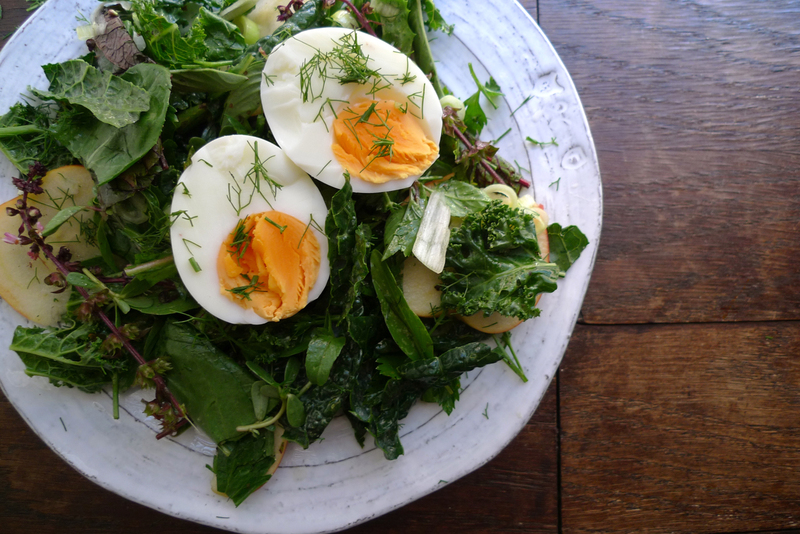 Be daring and mix greens that you would not usually combine to create a wonderful and healthy salad. Ask your farmer or health food supplier advise on how to serve new produce. They usually are a great source of information and inspiration. I have also noted some tips to use if you have a sensitive stomach like me. I have difficulty eating raw salads at the best of times. 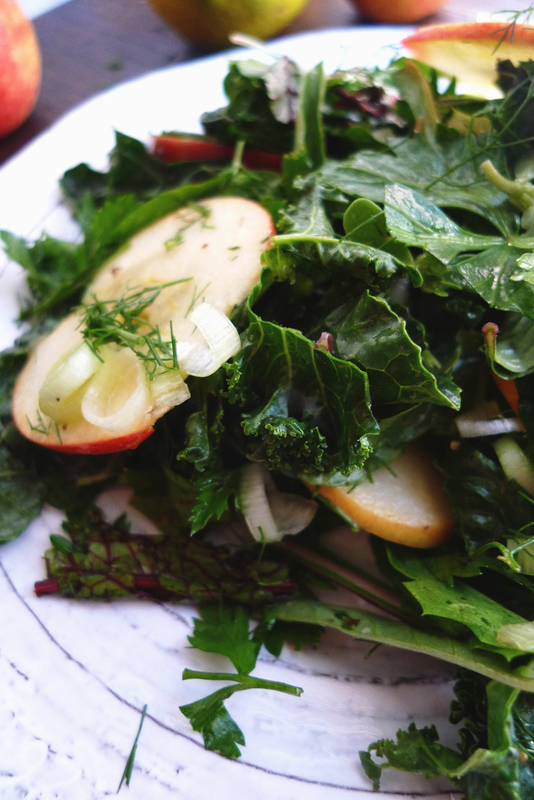 Tough greens such as kale, need to be softened for your stomach to digest them easier and to avoid discomfort. If you want to balance your salad with a protein, I have also given some suggestions. Enjoy! Roughly tear leaves into bit-size pieces. Tear kale and watercress leaves off stems (it is not suitable to eat the stems). Cut the white part of the spring onions into small discs. Place vinegar, lemon/lime juice, salt and 3 Tbsp olive oil in a bowl and whisk together. Add all leaves and toss together until well coated. Cover with plastic wrap and leave in the fridge to soften for desired texture. *see note regarding making the leaves easier to digest. Slice apples into thin slices and add to salad. Serve with a protein of your choice, such as egg, seeds or steamed fish. – If you suffer from IBS or find raw leaves too difficult to digest, you can lightly steam all leaves first then toss with dressing. – For additional protein, add your choice of seeds or nuts, or serve with steamed fish. – For a FODMAP-friendly meal, omit the spring onions and apples. – Apple cider vinegar can be substituted with balsamic, sherry or white wine vinegar.